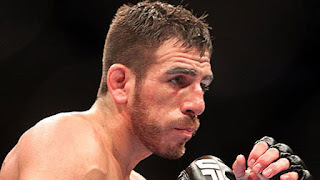 Kenny Florian moved closer to a lightweight title shot at UFC Fight Night 21. Florian beat former PRIDE fighter Takanori Gomi with a rear-naked choke in UFC’s return to Charlotte after a 15-year absence. UFC Fight Night 21 was a lead-in to the 11th season of The Ultimate Fighter, featuring Tito Ortiz and Chuck Liddell as coaches. After a power outage in the arena, Roy “Big Country” Nelson followed up his TUF 10 victory with a 39-second knockout over the 7-foot Stefon Struve. Jorge Rivera defeated Nate Quarry with a second-round TKO. TUF 9 winner Ross Pearson opened the Spike TV telecast with a unanimous decision over Dennis Siver. On the pre-show, Gerald Harris beat Mario Miranda by TKO with 11 seconds left in the first round. Yushin Okami defeated Lucio Linhares when the doctor stopped the fight in Round 2. Charlie “The Spaniard” Brenneman won a unanimous decision over Jason High. The rest of the preliminary bouts took place in the lightweight division. Nik Lentz won a unanimous decision over Rob Emerson; and Andre Winner achieved the same result over Rafaello Oliviera. Gleison Tibau beat Caol Uno by TKO at the 4:13 mark; and Jacob Volkmann won a split decision over Ronys Torres.